According to a source familiar with the matter, this issue has been resolved by Microsoft, but did not involve Windows Defender. I'm just getting these Malicious Software Removal, cumulative and security updates. But still no sign of getting 1809, still on 1803 and manual updates report I'm up to date. Plus winver still shows 1803. Is Avast still even needed on Windows 10 1809 and beyond, a lot of other forums I visit even if I ask a question on something not related to Avast, there like just drop it and use Defender & Malwarebytes, so far left Avast installed, and haven't gone the second route. I personally haven't see Malwarebytes "catch" anything in a very long time. Probably because it was already blocked by Avast. 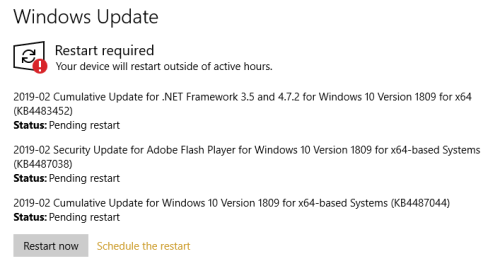 I'm not sure what scares me more, the fact that Updates can cause Problems or MS being able to remove them Automatically. Perhaps more detail in how they seek to do this, if there is no retained copy of the update, especially major updates like 1809 I'm still waiting on that. After a period of time MS removes that roll back ability. Or perhaps using System restore, which I have never had a high degree of confidence in (to the point I do regular hard disk backup images).